Michael Schumacher believes his record of seven world titles can be beaten - and that Lewis Hamilton could do it. Hamilton could clinch his first title in Brazil on Sunday - the McLaren driver has a seven-point lead over rival Felipe Massa of Ferrari. Schumacher told the BBC's Inside Sport programme: "I would say, absolutely, yes [Hamilton could win seven titles]. "Nobody thought, even me, that I could beat [Juan Manuel] Fangio. Then I did. Records are there to be beaten". The 39-year-old said losing the record would not bother him. "I'm quite relaxed that one day it will happen - whether it's Lewis, whether it's Massa, or whoever. "It might be someone of the current or of the future that could or will do it. But I've got no problem about it." Schumacher said he rated Hamilton "really highly" but was reluctant to say whether he thought he was the best active driver in F1. "When you think about what he has done in such a short time - just arriving and competing last year with [double world champion Fernando] Alonso and being very often quicker - that talks for itself. "Is he the best? Is he not the best? Is he better than Felipe Massa or not? You look at the circumstances; it is not always very straightforward or clear to understand from the outside." In the interview, Schumacher discussed the problems that led to Massa's team-mate Kimi Raikkonen falling out of contention in this year's championship after leading in the first half of the season. "They [Ferrari] have to protect him, in many ways, because in the middle of the season there were developments made with the car, and Kimi just simply didn't get on with this one," said Schumacher, who still tests for Ferrari in his role as a consultant for the team. "The moment we went back with those changes, we put him back into competitive lap times. "Kimi is only in his second year with us, so he's still in transition time. Felipe is already quite a bit longer with us, so unfortunately we have to face those problems." Schumacher also discussed his relationship with Raikkonen and rejected the possibility of ever making a comeback to F1. 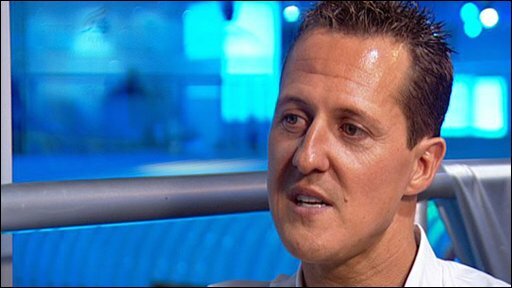 The full Schumacher interview is on Inside Sport on BBC One, Monday 27th October at 2320.